The Khibins are a relatively small mountainous massif with a total area of about 1300 km2 located in the central part of the Kola peninsula between 67°N and 68°N. Average elevations are about 900-1000 m and the highest point, Mount Fersman, is 1191 m. The Khibin mountains were first described in 1627 and mapped in 1745 (Magidovich and Magidovich, 1984). Although the early Russian settlements date back to the 16th century, it was the connection of the Khibins to Central Russia by road at the beginning of the 19th century that made the mountains accessible and facilitated their exploration and development. The first scientific expeditions visited the Khibins in the 1830s. In 1834, an expedition led by Shirokhin made hypsometric measurements and described alpine glaciers; in 1840, Middendorf provided the first description of the geology; in 1880, Kudryavtsev produced the first comprehensive physical geographical account of the region which included evidence of cover glaciation, neotectonic uplift, and altitudinal vegetation zonality. Perhaps the most important role in the early exploration of the Khibin mountains was played by the Finnish geologist Ramsay whose work on geology, Quaternary history, and hydrology, conducted in the Khibins between 1889 and 1892, remained unsurpassed for the next three decades. In the 1920s, in the course of an extensive geological survey led by Fersman, vast deposits of apatites, nickel, and copper were discovered. By that time, the region had already been connected with the south by rail and rapid industrial development followed in the early 1930s. The Khibin mountains formed about 364 Ma BP as a result of continental rifting and associated magmatism (Kogarko et al., 1981), were eroded during the Mesozoic, and rejuvenated by the Alpine orogeny (Barchatov et al., 1973; Koshechkin, 1979). 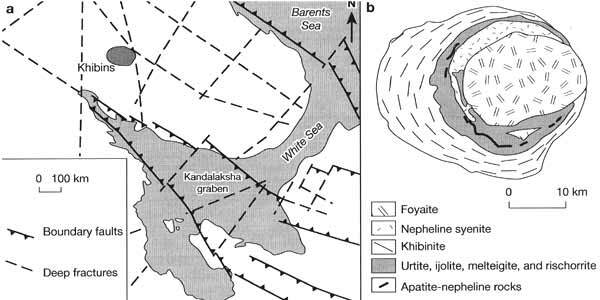 In the Paleozoic, the Kola peninsula, which is a part of the Baltic shield, experienced a series of alkaline intrusions as rifting occurred along and perpendicular to the Kandalaksha graben and the Kandalaksha deep fracture zone. Over twenty ultrabasaltic and alkaline complexes formed of which the Khibin massif is the largest. The Khibin complex, elliptical in shape and concentrically zoned, is composed mainly of nepheline syenites and rocks distinguished by a different participation of nepheline (Figure 13.1). The complex was formed during the seven intrusive phases and the most ancient rocks are substituted by the younger ones in a centripetal direction (Gerasimovsky et al., 1974). Since the Khibin mountains and its surroundings contain large deposits of apatite, the geology of the region is well researched. Among the vast literature dealing with the Paleozoic tectonics and geology of the Kola peninsula including the Khibins, monographs by Bulakh and Ivanikov (1984) and Kogarko et al. (1995), and review papers by Gerasimovsky et al. (1974), Kogarko (1987), and Bell et al. (1996) are recommended. Fig. 13.1 Map of the Kola peninsula showing the location of the main tectonic features and a simplified geological map of the Khibins. Located close to the Scandinavian centre of ice, the Khibin mountains were intensively and widely glaciated in the Pleistocene. The most substantial evidence was left by the Valday glaciation (see Table 2.1 and Figure 2.3 for chronology). The occurrence of the glacially derived erratic material on tops of the ridges dated to the early Valday confirms that the Khibins were covered by the ice sheet. During the later stages, the thickness of the ice sheet diminished and the upper mountains remained ice-free and formed nunataks. Till and fluvio-glacial deposits occur on slopes to an altitude of 600-700 m. In topographic depressions the thickness of till reaches 130 m and valleys are often blocked by transverse moraine ridges reaching 70 m in height. During the final stage of the Valday, glaciation bore an alpine character and numerous glacial troughs and, in particular, cirques (which occupy over 30 per cent of the total area) became a prominent feature of the Khibin landscape. The retreat of ice began soon after the Younger Dryas and by 8 Ka BP the upper parts of the mountains had largely become free of ice (Koshechkin, 1979; Vaschalova, 1986; Bakhmutov et al, 1991). Deglaciation is recorded in four terminal moraines positioned between 400-450 m and 700-900 m (Ryabtseva, 1970). In the course of the retreat, the morphology of glaciers was changing: during the first two phases valley and cirque glaciers prevailed while later only slope and cornice glaciers were common. Deglaciation was followed by the glacio-isostatic uplift of the Kola peninsula which in the Khibins reached 50 m during the last 7000 years (Nikonov, 1965). The isostatic response coincided with the ongoing orogeny which manifests itself in earthquakes reaching magnitude 4 on the Richter scale. Both the postglacial isostatic and erogenic uplifts have a considerable effect on the hydro-graphic network and sedimentation, such as intensive river incision and formation of alluvial cones in valleys and fans in lakes. Climatic fluctuations of the late Holocene and subsequent changes in vegetation and alpine glaciation are generally contemporaneous with those in Europe. Pollen data indicate that amelioration of climate occurred between 6.5 and 5 Ka BP when pine and birch thickets dominating the Khibin mountains were largely replaced by the more heat- and moisture-loving species such as Picea obovata and Alnus incana (Kremenetsky et al., 1997). Following a climatic cooling at about 4.5 Ka BP, forests declined, giving way to the tundra communities. Between 4.5 and 2.5 Ka BP, the composition of the forests became similar to the modern one: Picea obovata spread over a major part of the mountains; pine became restricted to its modern distribution area; Alnus incana declined and broad-leaved trees disappeared. These changes are consistent with the formation of a humid and cold climate (Vaschalova and Klimanov, 1987; Kremenetsky et al., 1997). The development of permafrost, which has an island distribution predominantly above 700 m above sea level and also in peat bogs (Yershov, 1989a), is dated to the period of severe climate between 3000 and 2.5 Ka BP (Perov, 1968). Another thermal optimum occurred in early medieval times. The period between the 5th and the 10th centuries was characterized by a marked retreat of alpine glaciers, the tree line was positioned about 200 m above its modern altitude and the formation of soils proceeded at an advanced rate (Perov, 1968). Conditions became cooler in the 13th century, marking the onset of the Little Ice Age, and remained so until the 19th century. During this phase, glacial advance renewed and cryogenic processes became more intense and widespread. Extensive talus and patterned ground were formed by frost weathering in plateaux and valleys and soils, formed during the preceding warm period, were overlain by solifluction-derived sediments in the lower parts of slopes. Thus, on the Khibin plateau (a remnant of the ancient peneplain elevated by the latest orogeny), the covering 0.5-1.5 m thick layer of coarse alluvium was transformed by cryogenic sorting into block fields. The contemporary glaciation in the Khibin mountains is limited to only four glaciers with a combined area of 0.1 km2 which have survived since the Little Ice Age (Perov, 1968). Although cold, the climate of the Khibin mountains is milder than that of the northern mountainous regions located further east as a result of the moderating influence of depressions tracking through the Gulfs of Bothnia and Finland (Borisov, 1965). The main features of the Khibin climate are a prolonged but relatively mild cold season, short and cool summers, high humidity, cloudiness, and strong winds throughout the year. The whole of the Kola peninsula is located within the zone of the subzero mean annual air temperatures. In the Khibins, the mean annual temperature decreases from -1°C in the foothills to about -5°C on the plateaux (Myagkov, 1986). The mean temperatures of the coldest month (February) in the low and middle mountains are about -12°C while the mean July temperatures vary between 9°C and 13°C. Small mean vertical temperature gradients in winter are explained by frequent temperature inversions. About twelve days with temperature inversions per month are registered in winter and on the individual days air temperature on plateaux can be 12-14°C higher than in valleys. The annual precipitation totals range between 1000 mm in valleys and 1500 mm in the high mountains with a maximum in autumn. In the middle mountains, about 70 per cent of precipitation occurs as snow. The duration of snow cover increases with altitude from 230 days in the foothills (Kirovsk) to 280 days at 1100 m (plateau Rasvumchorr) where it stays between September and June. The depth of snow cover rises from 100 cm to 200 cm, respectively. However, in the high mountains, as a result of strong winds, snow distribution is irregular: the depth of snow cover ranges from about 30 cm in open areas to over 10 m in protected sites (Perov, 1968). The abundance of snow and the prolonged winter season predetermine the development of snow patches, which stay throughout the first half of the warm period in the middle mountains, and perennial snow packs in the high mountains. These are composed of snow and firn (neve); the lateral dimensions vary between tens and hundreds of metres and their depth can reach 10 m. Snow patches and perennial snow packs are usually underlain by a thin layer of ice. The melt water is channelled along their margins or beneath the layer of ice intensifying the erosion and solifluction below and causing the accumulation of fine sediments (including humic matter) and soils. Therefore snow patches and perennial snow packs are an important control over slope processes and local vegetation patterns. Another consequence of the cold, humid climate is frequent avalanches. The Khibins are amongst the mountainous regions most prone to their formation: about a half of the total area is classified as being endangered by avalanches (Tushinsky, 1970; Dementiev, 1975; Myagkov and Kanaev, 1992). Avalanches occur throughout the cold season from September to June although they are most frequent between December and April. In contrast to many other regions, 80 per cent of avalanches form after snowfalls and blizzards as a result of the increasing snow load (typical of January and February) while avalanches associated with saturated conditions and reduced shear stress (typical of the April thaws) are less common. Although frequent, avalanches seldom have large volumes. This is because of the relatively small elevations and because avalanches follow snow-slide tracks rather than affect slopes as a whole (an opposite pattern is observed, for example, in the Sayan mountains). It was in the Khibins that the first avalanche control programme in the FSU was started in 1936. In contrast to the southern mountains, mud flows are a rare phenomenon in the Khibins but flows in which the solid fraction is represented by snow are common as in most of the subarctic mountains (Perov, 1995). These are most frequent during thawing in May and June and follow a rapid increase in temperature (Tushinsky, 1970; Perov, 1989). Such flows can travel a distance of 1-5 km, transporting about 40-50 thousand m3 of water, snow, and debris and leaving a thick layer of coarse deposits on melting. There are two models of vertical zonation for the Khibins. The first one distinguishes two zones (forests and alpine tundra) while the second one is more comprehensive and recognizes five belts: forests, birch woodlands, dwarf-shrub tundra, lichen tundra, and polar desert (Mishkin, 1953; Kryuchkov, 1967; Kuvaev, 1985). Forests develop on podzol soils up to 350-450 m above sea level. Picea obovata dominates (with an admixture of Betula spp. in the south and south-west) while in the northern regions forests composed of Pinus sylvestris are common. Intrazonal communities are represented by mires, which occupy substantial areas in valleys, and riparian forests comprised of Alnus spp. Bottoms of ancient glacial lakes and alluvial cones constituted of boulders and gravel are covered by heath. Typical of the Khibins are secondary small-leaved deciduous forests which replace coniferous forests destroyed by avalanches. Between 400 m and 600 m, a belt of open woodlands composed mainly of Betula tortuosa with an admixture of Juniperus sibirica, Salix spp., and Sorbus glabrata occurs on peaty soils. In its upper part, the thicket form of birch dominates. Woodlands are succeeded by the dwarf-shrub tundra, which occupies a belt between 600 m and 750 m, and lichen tundra between 750 m and 900 m. In this belt, soils are stony with poorly developed profiles. Vegetation often does not form a continuous cover and large areas are occupied by block fields and outcrops of rocks. The polar desert communities develop in the upper parts of slopes and on watersheds where vegetation occupies not more than 1 per cent of the total area. Soil cover is virtually absent and vegetation is represented mainly by crust lichens, while higher plants occur only in protected habitats. Until the beginning of the 20th century, human activity had a negligible impact on the environment of the Khibin mountains. The discovery of the commercially valuable ores has changed the situation dramatically. The large industrial centre of Kirovsk, accommodating a large chemical industry and non-ferrous metallurgy, developed at the southern margin of the massif. Industrial pollution and degradation of vegetation in the Kola peninsula are discussed below.